Pramilla Malick was one of many residents of Orange County who spent their Valentine’s Day outside the Thurgood Marshall Courthouse where the corruption trial of Joseph Percoco, a former top aide to New York Governor Cuomo, is going on. Percoco is on trial for taking hundreds of thousands of dollars in bribes from the company that’s building the CPV fracked gas power plant in Orange County. “The day those indictments were announced, this project should have been shut down,” said Malick. Being in court and hearing the evidence confirms what she and many impacted community members have been saying for years, that this project would not have received approval without corrupt influence. Governor Cuomo banned fracking in New York in 2014, but the state is expanding its use of fracked gas for heating and energy, building pipelines, compressor stations and power plants like CPV all over the state. Martens and his wife Melissa joked about their big Valentine’s Day protest plans. Fighting this plant has become their life. Every Saturday they’re at the weekly picket outside the plant. It’s the longest running anti-fracking protest in the state. Yet most of the mainstream media coverage of the Percoco trial has focused on how it may impact the Governor’s political career and little on how the plant will impact the Orange County community. The CPV fracked gas power plant will emit 700 tons of known carcinogens, neurotoxins, and endocrine disruptors a year. It also requires 100–150 fracking wells a year to supply the gas it needs. 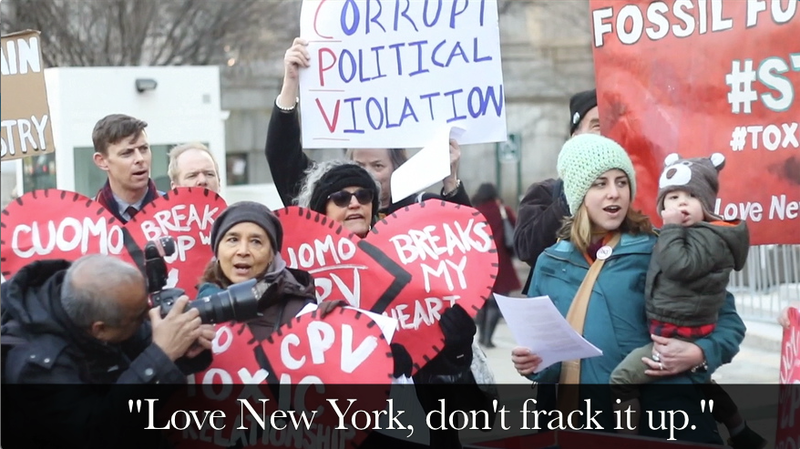 Since New York banned fracking, families in Pennsylvania will be exposed to all the risks Governor Cuomo said were too great for the people of New York. The plant will also greatly contribute to climate change meaning it also threatens the city it’s supposed to power, New York City. Resist Spectra has been fighting to stop the Algonquin Pipeline Expansion, a fracked gas pipeline that was put in dangerously closely to critical infrastructure at the Indian Point nuclear power plant. “If Cuomo wants to be an environmental leader, he’s got to step up and stop fracking infrastructure,” said Tina Bongar of Resist Spectra. City Council member Jumaane Williams, who recently announced he is running for Lieutenant Governor was also at the rally. For those living in the sacrifice zones of fracked gas infrastructure projects like CPV, the time for lip service from Governor Cuomo is over. Their message is clear, real climate leaders don’t build fracked gas infrastructure. Sign the pledge to resist NY inFRACKstructure on April 23rd in Albany.